Kellie Hall, a Columbus-transplant, has now lived in the city for over a year. Because her career as a Naval Officer has requires many moves, she turned to Bumble a year ago to make friends. It was then that Hall realized the power this social networking app had. “I was able to connect, meet, and develop relationships all from the comfort of a ‘right swipe’ on my couch,” says Hall. Now, she’s the Columbus Queen Bee Ambassador for Bumble and hosts two events a month, continuing to connect others and bring the community together. One of the friends she met through “Bumble BFF” sent in the application for her. Hall recalls how her friend said, “if I didn’t apply, she would apply for me,” she laughs. Hall describes how she’d already been advocating for the app prior to becoming the ambassador because she believes in it so much. “I met all of my friends through Bumble BFF in a matter of a month of moving to Columbus,” she says. Hall has hosted two events in Columbus so far: a brunch and a workout with OrangeTheory. Each time Hall brings women together, she sees them willfully introduce themselves to each other, swap phone numbers, and add each other on Instagram. Within these last two events they’ve had about 50 women show up. 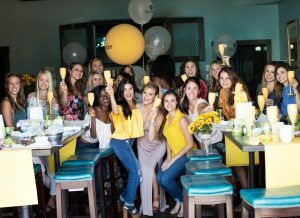 This October, Hall hosted ” Network with Bumble: a Bumble Biz Launch Party.” Bumble Bizz is unique because switching to Bizz mode gives you the ability to change your professional life from the palm of your hand. Every swipe is an opportunity to expand your network and make empowering career moves. Hall details that to get Bumble Bizz, just update your Bumble app through the app store. Bumble Bizz is now live in the US, Canada, UK, France, and Germany; and’ll be available globally soon. Aside from the October “Bumble Bizz” event, Hall shares that they’ll soon host a “Friendsgiving” event at Copious for a small group of “Bumble BFF’s.” Additionally, they’ll be arranging an opportunity to volunteer with the community through one of their local charities (stand by for details). Hall is currently working to have over 20 women assist in one of these community projects. The Columbus Bumble team currently has seven members: Kellie Hall and six “Local Bees” who assist her. Three of those “Local Bees” are friends Hall previously met through the Bumble BFF app and now are ambassadors as well. You can learn more about Bumble by visiting online at www.bumble.com or downloading the app through iTunes or Google Play. Follow Bumble, Bumble BFF, and Bumble Bizz on Instagram. And be sure to follow Hall, the Columbus Queen Bee Ambassador herself, on Instagram: @kellierenehall.